Introducing our 2019 SYP Head Staff Team! As the start of Summer Youth Programs quickly approaches, we are very excited to introduce you to our 2019 SYP Head Staff team. This amazing group of Michigan Tech students take on additional leadership in the summer, including training during orientation, coordinating staff schedules, and problem-solving when the unexpected arises. I have been a counselor in the past and really enjoyed igniting students’ passion for STEM and asking them questions. I am looking forward to using my past experiences as an activity and day counselor to solve any issues and develop some new campus activities that are free/low cost for participants to try. Returning Head Operations Counselor Robert Lambert shared the value of being a second-year as a Head Counselor and third year member of the SYP staff. I really enjoyed last summer as a head counselor and grew a lot as a leader and a person. This year I am starting with a better understanding of my role and bringing more experience and attention to details. Mallory Benkert worked with SYP last year as a Student Coordinator; this year, she will bring those strong organizational skills to the leadership team as as Head Counselors’ Counselor. And, no, you didn’t read that wrong—although it is an odd job title! The HCC is in charge of scheduling, general check-ins, and any concerns from the staff members themselves. I was motivated to apply to be on the leadership team so I can be more “in” the scenes than “behind” the scenes. Zachary Smith and Skylar Callis also bring a summer of experience to their roles, and will both be taking on new perspectives within SYP. Zach worked at the front desk last year and will move into the Head Residence Counselor Role. Skylar, meanwhile, is taking on Head Operations with Rob after spending last year as a Residence Counselors. As June approaches and final plans fall into place, we are very excited to work with this Head Staff and our full SYP team to bring another great summer of programs to you. We come back year after year, too, because as it turns out, we love this opportunity just as much as our students do. It’s so much more than a camp or class—it’s an experience. And for many, it’s life changing. At the end of each summer we ask students to share with us what attending Summer Youth Programs meant to them in the form of a story contest, these stories never disappoint! Our 2018 middle school level winner shares her story below. We love reading stories like Devin’s and hearing that students are not only learning about careers, but building confidence and independence in themselves and their ability to succeed in college. We also hope that Devin comes back this summer to learn even more and work on her own path to becoming a successful engineer. Application Deadlines for Scholarship Programs! Applicants to WIE, ESP, JWIE, WICS, and WIAE who submit a complete set of materials by 5:00 p.m. EDT, April 10, will be considered for acceptance. We do honor postmark, so get everything together and in the mail on that date! Why apply for one of these intensive STEM programs? The opportunities students will have are so vast: work in teams to test bridge models; solder circuit boards; find out about the human factors in automotive design; explore cybersecurity and virtual reality. 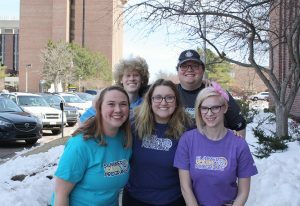 In addition, a week on campus has so many experiences to offer, from living with a roommate to eating in the dining hall, managing your own time in the evening to seeing the beauty of the Keweenaw Peninsula. My experience in the Engineering Scholars Program has been a mix of both meaningful and enjoyable. This unforgettable week has taught me about various fields in engineering and has provided me with the hands-on experience to think and solve crucial problems like an engineer. One of my favorite parts was the first-hand feel for what it is like to live on campus and stepping into the shoes of a college student. More details about the scholarship programs, including required application materials, can be found on our website. If you have any questions, you can always reach us at syp@mtu.edu or by phone at 906-487-2219. Following Michigan Tech’s spring break, we all returned with a ton of enthusiasm here in the Center for Pre-College Outreach. Among many other springtime happenings, March brings the first all-staff gathering of a Summer Youth Programs cycle! This Spring Training was held on March 20th for all staff who accepted a position with SYP. From residence counselors to chaperones, we all gathered together to accomplish a few pre-summer goals. First and foremost, Spring Training provides an opportunity for the head counselors to meet their staff: as peer leaders, it is critical to start building a sense of teamwork as soon as possible! The different staff groups got together to learn names, ask preliminary questions, and get a feel for what their summer will look like. From there, we spend time outlining summer expectations. We discuss the schedule: what weeks are SYP explorations running? When are the competitive scholarship programs? Which days do staff get off? We also cover expectations of ensuring safety, acting as excellent role models, providing a welcoming and inclusive experience, and the impact of SYP. Staff are also introduced to the first few items on their training checklist: what days first aid/CPR training is offered, when they will receive their general safety awareness training links, and the time frame for picking up staff books. All in all, Spring Training is a great primer for getting staff excited and prepared for another great summer! All of the details about the scholarship programs, including required application materials, can be found on our website. If you have any questions, you can always reach us at syp@mtu.edu or by phone at 906-487-2219. Why Is It Important To Send My Child To Camp? The mission of Summer Youth Programs to provide quality, innovative teaching and learning experiences that promote academic studies, college life, and career awareness. Through hands-on, discovery based programs, students break out of their comfort zone and stretch their imaginations-without the pressure of grades, exams, or assignments. Our facilities, along with research and teaching faculty, deans, and advisers, help students develop college and career goals. Current Michigan Tech students serve as role models, providing inspiration, encouragement and guidance. We survey students each year to determine the impact of our programs on this mission. Here is information gathered from the 2017 Summer Youth Programs student surveys. Camp and summer programs provide an excellent experience for your child to learn and develop and is uniquely positioned to provide many key developmental needs for children. Consider camp as the perfect partner to family, school, and community youth activities in helping your child learn independence, decision-making, social and emotional skills, character building and values – all in an atmosphere of creativity and enrichment under the supervision of positive adult role models. In today’s pressure-oriented society, camp provides a non-threatening environment for youth to be active, to develop competence in life skills, to learn about and enhance their own abilities and to benefit from meaningful participation in a community designed just for them. In addition, our programs invite students to dive into STEM and learning intentionally and purposefully. Students gain valuable insight into what their future career could look like before they even begin college. Attention students in 9-11 grades who have a business idea! Come and learn the innovation design process used by companies like Google and Apple to create the next great product or service. The “From Idea to Market” exploration will introduce you to the exciting world of design thinking… a human-centered process for developing innovative solutions to life’s messy problems. Students will identify a problem the y’d like to address and apply the design thinking process to create an innovative solution. From there, you will learn the basics of what it takes to start a business by applying the Lean Start-up process to develop a business model, you’ll pitch your idea to a panel of judges, and you’ll have an opportunity to market your ideas right here on campus. Each day of the week you’ll learn different innovation and business start-up skills through a variety faculty and student-led activities. No prior experience or knowledge is necessary to become a Michigan Tech SYP innovator and entrepreneur! This course is offered in partnership with Michigan Tech’s Pavlis Honor College and the School of Business and Economics. February is coming to an end, which means it is time for a first round of acceptances to three of our flagship programs: Women in Engineering (WIE), Engineering Scholars Program (ESP), and Women in Computer Science (WICS). Our “early accept” deadline is tomorrow, which also reminds us of how quickly summer is approaching! Applicants to WIE, ESP, and WICS who submit a complete set of materials by 5:00 p.m. EST, March 1, will be considered for early acceptance. We do honor postmark, if you can get everything together and in the mail on that date. Why do we do two rounds of selection for some of these programs? For many years, we held one deadline for all programs, ready to tackle a huge round of decisions. But, people started letting us know that they need to know sooner—with family vacations, band camps, the start of sports season, coordinating travel arrangements, and other summer obligations, it became increasingly important to know whether or not a student was accepted to one of our programs. Being based at a university, we know all about early application deadlines in a college context, and decided to implement something similar for a few of our programs. There is no specific advantage or preference for this group; the benefit is primarily for families who need to plan ahead. It’s also very helpful for our international applicants, who might need extra lead time to secure a visa, book a flight, or make other arrangements. With summer just around the corner (or should I say somewhere around the snowbank! ), the time has come for us to hold interviews and begin filling the 65+ roles that it takes to make SYP a great experience. Each year, we hire a large seasonal staff for a wide variety of roles from live-in counselor to bus chaperones. This team, many of whom are current Michigan Tech students, always bring their own life experiences, fresh perspectives, and what we call a #BeAwesome attitude to the program—each summer is unique! So, how do we build a successful team? With over 1,000 participants attending our summer programs, we rely on the staff in many ways and they need to be prepared for anything! The good news is, a lot of our staff already know so much before they even apply. 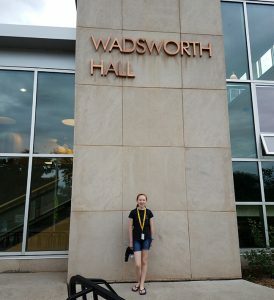 With over 700 SYP alumni now attending Michigan Tech, it’s no surprise when many of them want to come back to the program to work as a counselor. They looked up to past SYP counselors for guidance and saw them as positive role models—now they want to give back. These program alumni, along with our dedicated returning staff, are excited to recreate the positive and inviting environment they experienced with SYP and become leaders for new staff members. Once our team is selected, the real fun begins! Before any participants arrive on campus, our full team goes through extensive training both in-person, online, and through independent reading. We utilize Expert Online Training sessions that include educational videos and quizzes to prepare staff about problem solving, bullies, becoming a youth development professional, cultivating patience, listening, safe talk and safe touch, helping students fit in, supervising, and more. All staff then attend a week-long training the week before programs begin that covers: CPR/First Aid training, van certification, background checks, building security, fire drills, mandated reporter training, Title IX training, case studies, student/staff rules and expectations, inclusion conversations, and much more. Even after this week is over, the training never really ends. The best counselors know that they are always learning and growing as they meet new participants each week. Some even say they don’t want it to end. As a professional staff, we are so grateful to the incredible student staff who are the heart and soul of SYP—especially to our returners and head staff, some of whom have dedicated three, four, or even more summers to inspiring young people. We come back year after year, too, because as it turns out, we love this opportunity just as much as our students do. It’s so much more than a camp or class-it’s an experience. And for many, it’s life changing. Watching it all unfold; the friendships, the lessons learned, and the discovery of a career path they are passionate about, is what makes each year of planning all worth it. Have you ever wondered what it takes to start your own business? Got an idea for a product or innovation that you want to get going on? Love problem-solving? If any of these questions sound like you or someone you know, consider a new exploration that Summer Youth Programs (SYP) is offering this year: From Idea to Market. 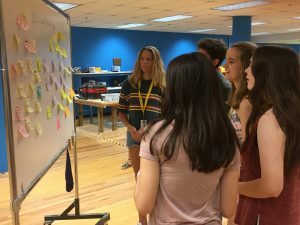 Created as a hybrid of two previous explorations (Be Your Own Boss and The World of Design), From Idea to Market is hosted jointly by Michigan Tech’s School of Business and Economics and the Pavlis Honors College. 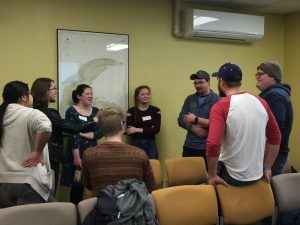 To get a first-hand account of how fun a course like this can be, we talked to current Michigan Tech student Sarah Smyth, who attended Be Your Own Boss when she was a high school student. “I decided to try the business exploration because I wanted to see a bit of what business is like,” Smyth says. She notes that she enjoyed business-related courses in high school and wanted to explore the field further by coming to SYP. From Idea to Market will cover many aspects of business as well as design thinking: a human-centered process for developing innovative solutions to life’s messy problems. Students will identify a problem they’d like to address and apply the design thinking process to create an innovative solution. 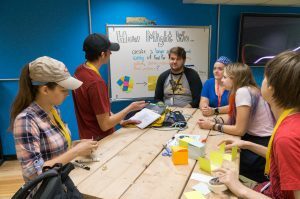 Students explore design thinking at The Alley, Michigan Tech’s MakerSpace. The course will then dive into the basics of what it takes to start a business by applying the Lean Start-up process to develop a business model. Get ready to pitch your idea to a panel of judges—and you’ll have an opportunity to market your ideas right here on campus. Students meet with a local business owner at KC Bonker’s toys and coffee. What else does Sarah remember from her time at SYP outside of class? 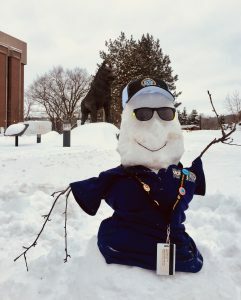 The experience of being on campus during the summer, making friends, and finding out what being a Husky is all about. SYP has some of the best people you will ever meet. Everyone is so open and friendly. When going to the beach trip I forgot my swimsuit but a girl I never talked to before offered me her extra one and we got to hang out in the water together. The people here really do care about you and that’s what makes Michigan Tech such an amazing place to go. We can’t wait to see some of you this June at From Idea to Market. If you’re like us and are already excited for SYP 2019, visit the online course listing to sign up today or request a mailed catalog. If you have any questions, you can always find us at syp@mtu.edu or by phone at 906-487-2219. 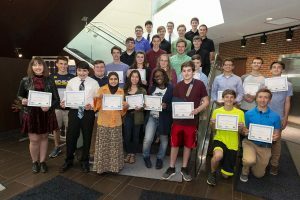 We are pleased to announce that Hemlock Semiconductor Corporation (HSC) will once again be sponsoring 30 scholarships aimed at Michigan high schoolers from Midland, Saginaw, and Bay counties who have expressed an interest in STEM education (science, technology, engineering, and math) or have demonstrated scholastic success in those subjects. 2018 recipients of the award during a reception at HSC. Students must apply and be selected competitively; selected students will receive a scholarship valued at $1000 to cover the tuition, boarding, and transportation to attend the Engineering Scholars Program at Michigan Technological University. 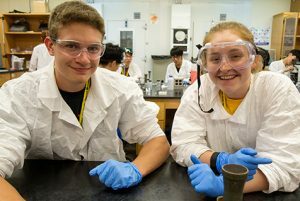 ESP is hosted every year by Michigan Tech Summer Youth Programs; this year, it will be offered during the week of July 21–27, 2019. Throughout the week, students are exposed to 10+ types of engineering through group projects, engineering sessions, creative problem-solving activities, and special topic sessions. This award is for students who attend a school located in Midland, Bay, or Saginaw counties. Eleventh grade students will be given first priority; high-performing ninth and tenth graders may also be considered. All students should have an interest in STEM education or careers, and have demonstrated scholastic success in these subjects. Michigan Technological University will review applications and select scholarship recipients based on merit. At least one award will be guaranteed per school with applicants; more than one from a given school will be considered if additional spots remain. Questions about this award are welcome at the Summer Youth Programs office at 906-487-2219 or esp@mtu.edu.